Guesthouse Fischreiher offers accommodation in 5 neat, exquisitely furnished double rooms all en suite/ safe inside parking/ laundry facilities. Walking distance from the sea/ quiet area. Guesthouse Fischreiher is an old house built back in the 1970's and renovated for hospitality reasons in 2005. We offer you exccellent service, clean rooms and fresh bedding, hearty breakfast, and the best of Namibian friendliness. Room nr 2 - Pelican Room: Twin beds, shower ensuite, TV, coffee/tee, refrigerator, walking out on balcony, sea view. Room nr 3 - Cormorant Room: Twin beds, shower ensuite, TV, coffee/tee, walking out on balcony, sea view. Room nr 4 - Fischreiher Room: Twin beds, shower ensuite, TV, coffee/tee, refrigerator. Room nr 5 - Damara Tern Rm: 1 Double bed & 2twin beds, TV, Bath shower ensuite, coffee/tee, rerigerator. Room cost: R540 for double, R190 extra per adult for single beds. 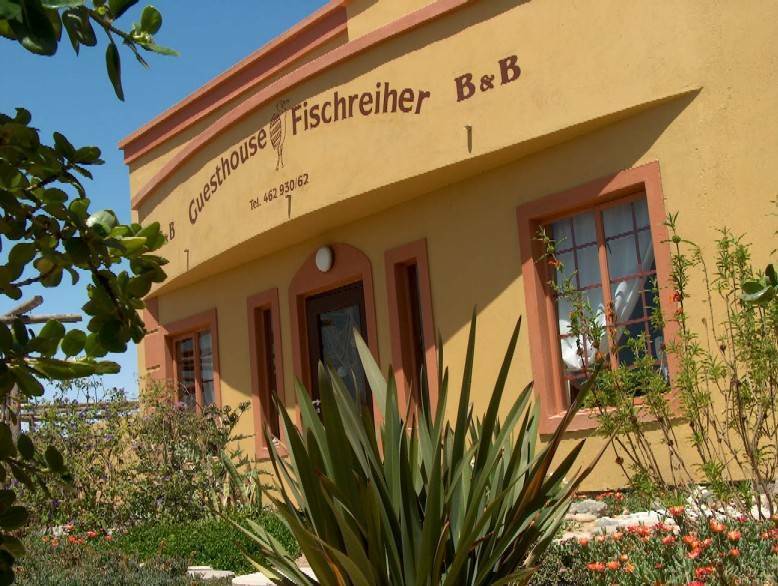 Guesthouse Fischreiher is situated in Swakopmund at the coast of Namibia that is part of the Namib desert. When you visit Namibia, a guided travel into the oldest desert on the globe, is a must. Swakopmund has a unique character and the coast with its special environment and wildlife is worthwhile to experience. To confirm booking, pay 50%. Cancellation fee of 25% will be charged for cancellation 7 days before arrival and 100% for cancellation less than 48 hours prior to arrival. When you enter Swakopmund from Windhoek, first robot turn right, go on untill a circle, planted with green grass/ turn left into Vrede Rede street, go on untill T-junction/ turn right into First Avenue/ this street becomes Fischreiher street - the hous is on the righthand side with a big 78 on the wall. You cant miss it!